The pink annual flowers are perfect for a pink themed garden design. 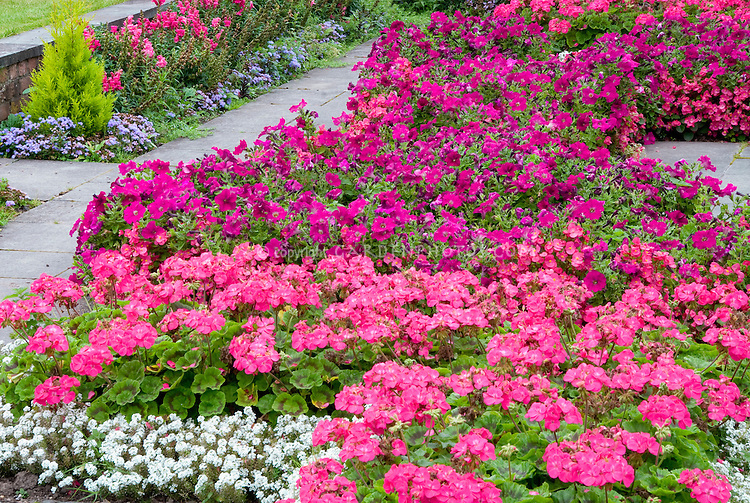 As you know, a pink garden offers lots of visual interest to any yard. It is versatile and sophisticated enough that it can improve the look of any landscape. Moreover, the bright shade of pink could carry well under the shade or under the sun. Here are some of the most beautiful pink theme garden ideas that make use of pink annual flowers. 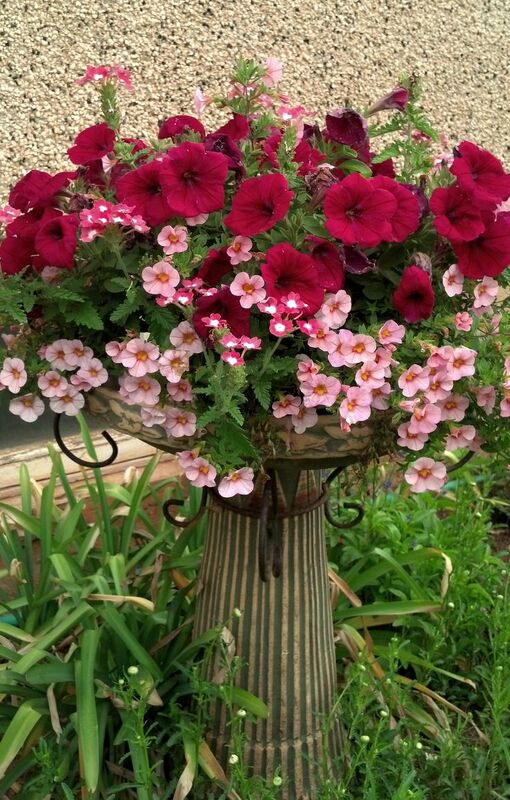 Geraniums are a perfect choice when it comes to pink garden flowers. Thus, if your idea of a pink garden is to fill it with a bed of flowers, consider growing lots of pink Geraniums. Incorporate other annual flowers in the garden as well. Perhaps, you can have some purple or white flowers as borders. 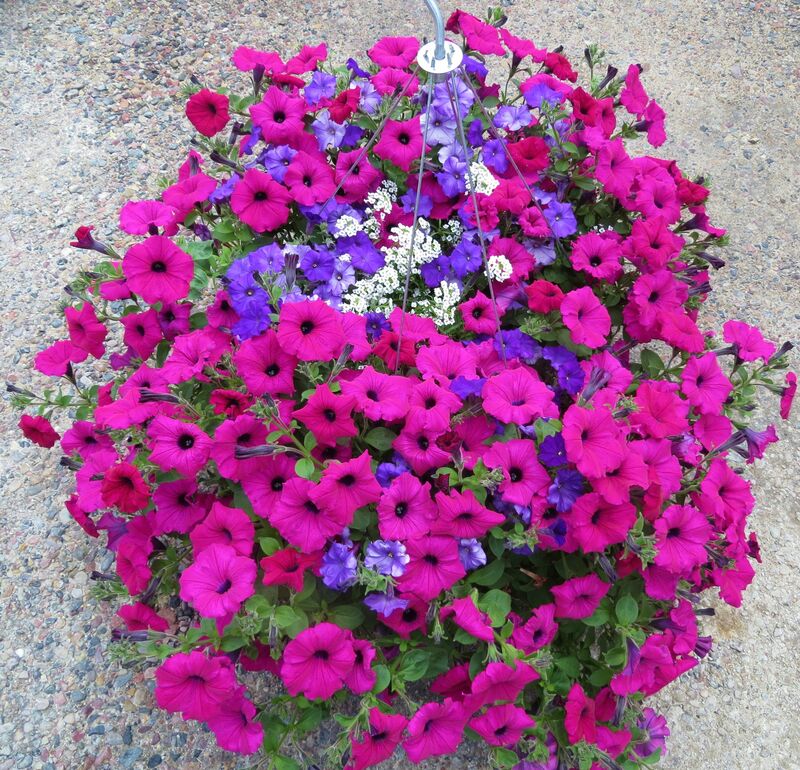 Bright pink petunias in a hanging basket can make for an awesome curb appeal. In fact, petunias are a classic favorite for hanging baskets. 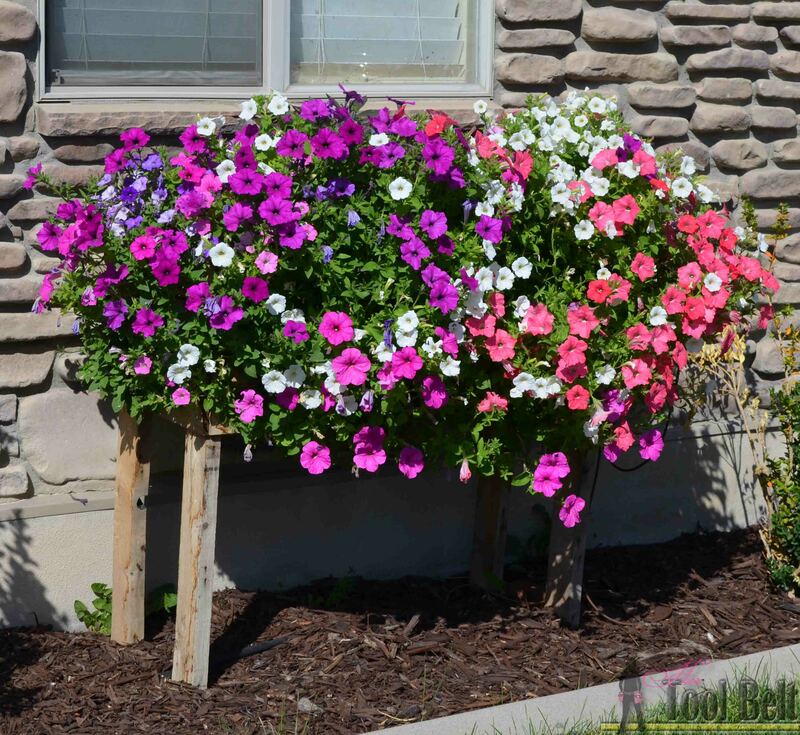 Simply fill any basket with these lush annuals and hang it in your patio. You can even hang it just outside the door. It’s definitely a great way to welcome visiting guests. Consider adding a few purple petunias and some tiny white flowers in the middle. If your goal is to simply add a few pink touches to your garden, then grow some Cherry Zinnias along with other flowers. You can also grow some purple annuals to offset the pink shade of the Zinnia. Grow lots of greens, such as bushes, shrubs, trees and some grasses too. Using a unique planter such as these tree stumps is another smart idea for your pink themed garden. Give your garden a fabulous appeal by simply transforming tree stumps into planters. Fill the planter with lots of red, purple and pink annual flowers. 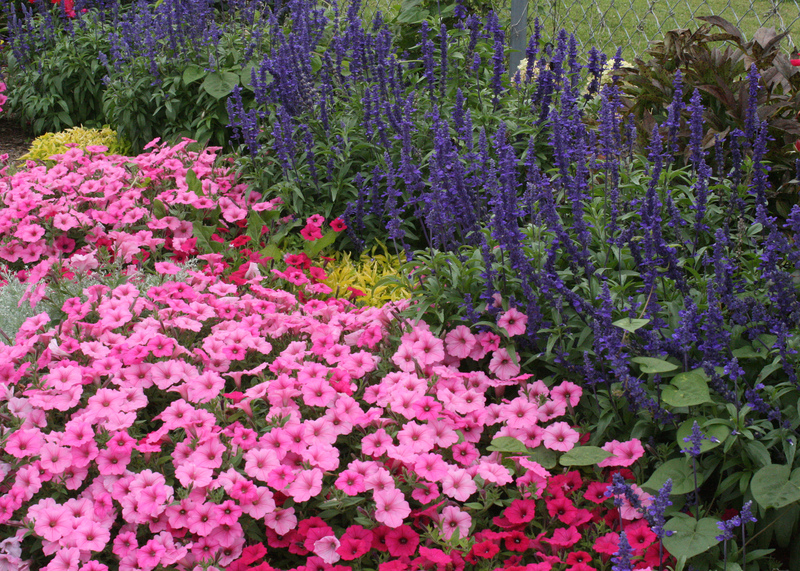 Choose those pink fluffy flowers, such as petunias, pansies or whatever you like. Planters made of old wheelbarrow are becoming popular these days for garden ornaments. You can choose to paint the wheelbarrow or leave it as is for a rustic appeal. However, since it’s made of wood, fungi and molds could penetrate if left unpainted. Install as many pink annuals as you can on the planter. Use a mixture of compost and soil to support the flowers that you will plant in the wheelbarrow. Growing hot pink flowers around a tree can result in a wonderful landscape. However, it’s important to observe precautions to keep the tree protected. For instance, avoid digging below the tree canopy. Instead, spread some layers of topsoil and cover this with mulch. Afterwards, dig holes on this medium and plant your pink annual flowers. Your pink garden need not be all pink. Or else, it will look boring. 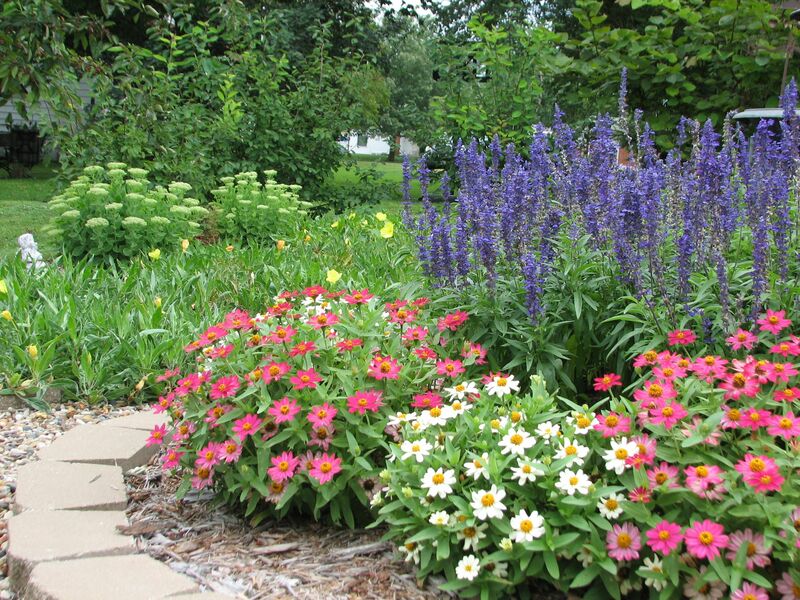 You can make your garden stand out if you grow contrasting colors of annuals. For instance, the Bubblegum Supertunias will look even prettier when grown beside purple blooms. Other colors that will contrast pink are blue and green. Thus, consider growing lots of greens in your garden as well. When you do a search for the list of pink flowers, tulips will surely come up on the list. Indeed, tulips are an excellent choice of flowers for a pink themed garden. 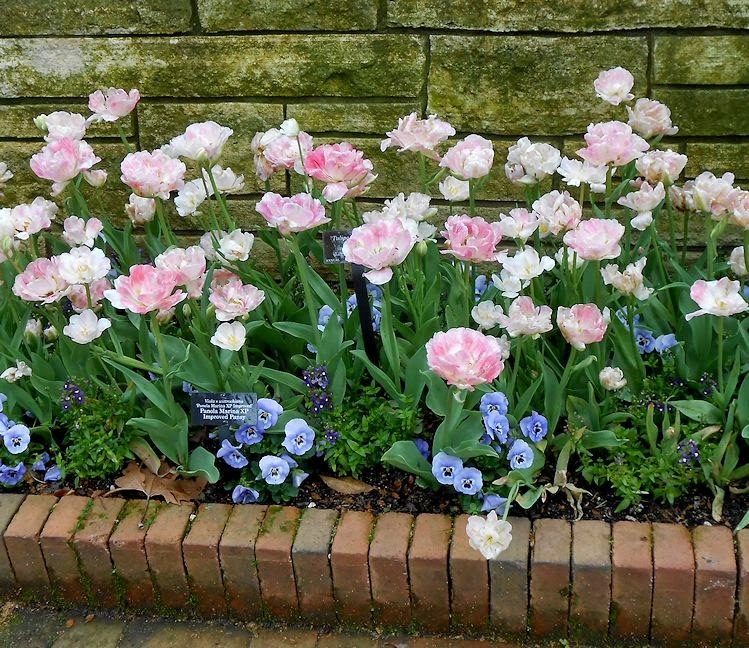 A great planting idea for tulips is to use them as borders or edging. You can mix and match different tulip varieties. For instance, the dazzling border above consists of four different tulip varieties and colors, ranging from soft pink to the violet shades. A garden path allows you to easily get access to your plants for viewing and for doing some chores. Furthermore, a path can also help to divide distinct areas of your garden. For instance, you can separate a formal garden to the butterfly garden, and so on. A well-designed path using pink annuals similar to the design above is a great idea. If you want to exude a rustic charm into your pink garden, then consider the use of a rustic inspired planter. As seen above, you can make an old concrete planter to stand out by filling it with pink pansies and violas. You can perhaps install a couple of these planters on your garden entrance to welcome visiting guests. If you want to give life to your boring garden wall, consider growing pink fluffy flowers beside it. As you can see above, the light pink tulips have made a dull looking concrete wall look charming. To make it even more beautiful, incorporate the pink flowers with contrasting shades, such as blue pansies. Create a contrast and a visual vibrancy in your pink garden by growing the pink annuals in between lush green shrubs. From the list of pink flowers, choose your favorite and plant it in between evergreen shrubs. 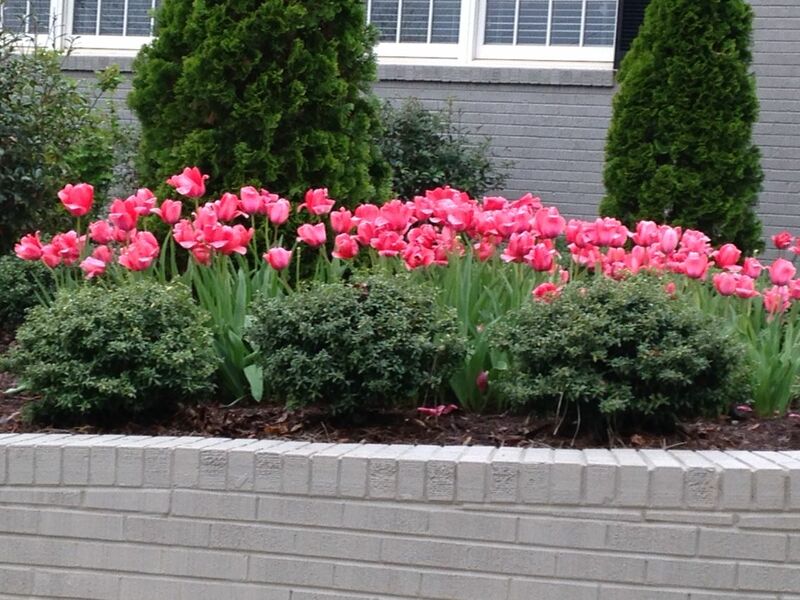 For instance, you can have bright pink tulips planted in between green shrubs and tall trees. 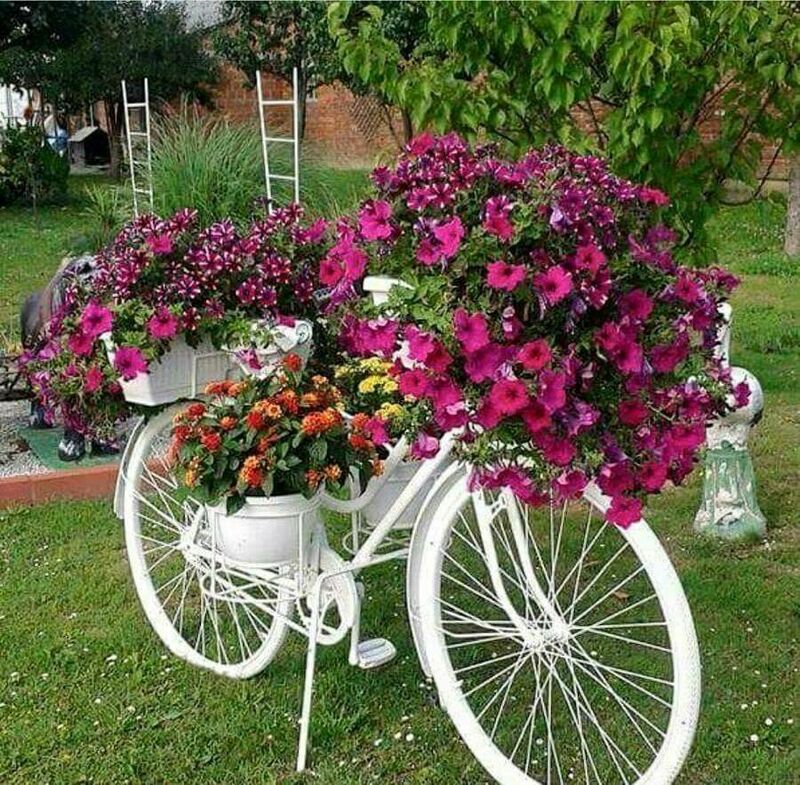 Another charming DIY planter is the use of recycled bike. You can salvage an old bike from a junkyard and paint it in plain white. Then, fill it with as many potted pink flowers as you can. The white color has made the vibrant pink flowers to look even more charming. You can then place this in one corner of your garden. Otherwise, you can place the bike at your front patio to improve your home’s curb appeal. Give your garden privacy by planting a hedge of hydrangeas in the pastel shades. The hedge above will not only give you the much needed privacy, but will also help to make your garden look even more beautiful. However, you need to remember that the deciduous shrubs will tend to loose their leaves during fall. Therefore, consider growing the hydrangeas along with boxwood and other evergreens. If you are trying to build a pink themed cottage garden, take inspiration from the photo above. There are several fast growing annual vines that produce pink annual flowers that can crawl above a cottage. You can also grow other annuals that produce other shades of color. However, you can make pink to stand out by growing several of them. If you do not have enough space in your yard to create a huge garden, consider growing hot pink flowers in pots. Group them together and you will have a charming pink garden of potted flowers. In order not to look boring, avoid growing similar variety of annuals. Instead, grow different types of them similar to what’s shown above. As you see, the three different pots have three different annuals, although all three produces pink flowers. Mix colors of annual flowers in a container are definitely among the hottest trend in gardening these days. 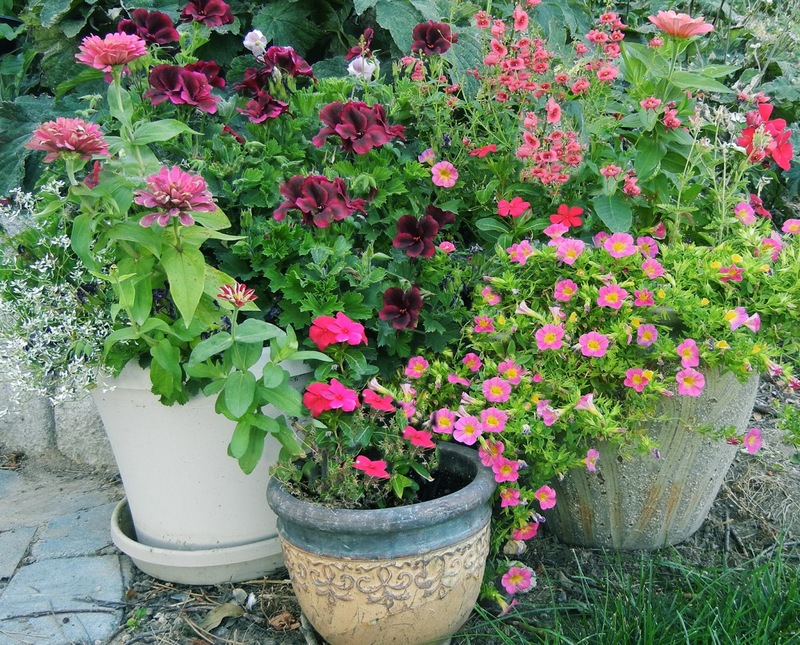 These colorful annuals that burst out happily from the containers will surely stand out in your pink garden. This is also a great idea for those with limited garden space. In addition, these containers can prettify your patios and balconies. In fact, even bigger gardens can benefit from this by creating a charming focal point and by brightening a dull looking garden wall. Another great idea if you want a rustic charm look for your pink themed garden is to convert an old birdbath to a planter. This DIY planter can make for a charming focal point in your garden. It’s easy to make, too. In fact, all you need is to fill an old birdbath with lots of pink flowers of your choice. Here, this rustic inspired birdbath is filled with an assortment of pink annuals. If your garden is surrounded with a fence, then grow some annual flowering vines that could crawl into the fence. For instance, these pink annual flowers have made this plain white fence look even more charming. Moreover, you can also choose to drape these pink flowers in a garden wall or at your patio. If you want a faster way to perk up your garden, transfer your pots of pink garden flowers from your indoors to the outdoors. However, make sure that you arrange the flowers well so they will not look chaotic. Here, a combination of pink and purple fluffy annuals looks more cohesive than chaotic. The use of pallets in a garden is not something new. In fact, most DIY garden planters involves the use of pallets. Aside from being economical, it’s also easy to work on. Here, a pallet has been transformed into a box planter to accommodate an assortment of pink annuals. You can also add a few white and blue annuals so it will not look monotonous. As you see, there are absolutely so many ideas that you can incorporate when it comes to designing a pink garden using pink annual flowers. You just need to be as creative as you can and don’t be afraid to explore other new ideas too.